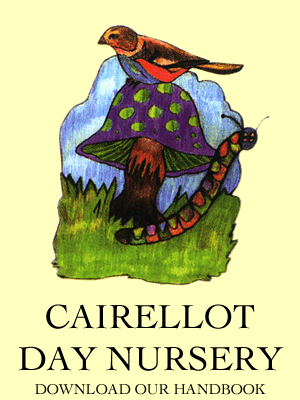 Cairellot operates in partnership with Renfrewshire Council and our community nursery is a service that we offer for pre-school children who attend the government funded pre-school sessions. These currently run for 38 weeks per year, 2 ½ hour sessions per day, morning or afternoon. The Fluffy Cloud Room is large and bright and is equipped with a range of resources to support each child’s learning. Our staff team promote independence and encourage children to develop new skills through activities, play, discussion and new experiences. For children aged 3-5 years, we work in line with the national framework of Curriculum for Excellence (CfE). This is the learning programme that operates for all children in Scotland from the ages of 3-18 years. The early level stage of CfE is outlined for children aged 3- 6 years and a child’s nursery experience provides them with the important first steps into early education. NB Our community nursery follows Cairellot’s ethos, aims and values but is bound by Renfrewshire Council admissions policy for the allocation of places, please contact Cairellot for further details.